After a tasty dinner at the Red and White Club in Calgary on April 10, 2019, polar bear researcher and author Dr. Susan Crockford showed evidence that polar bears are far more resilient to climate change that is commonly believed. She showed that polar bear populations have been increasing in recent decades despite the declining summer sea ice area. The global polar bear population has likely increased by a factor of 4 from the 1960’s to around 39,000 today. She sold her new book “The Polar Bear Catastrophe that Never Happened” at the event, which is available here. Next, Dr. Willie Soon showed the audience that there are strong correlations between daytime high temperatures and the variations of solar radiation, implying that the sun is the main driver of climate change. Dr. Soon shows that the variability of solar radiation is much larger than suggested by the sun spot numbers. He also presented clear evidence that the government temperature indexes are strongly affected by the urban heat island effect. The two presentations are available on the Friends of Science website. Dr. Judith Curry has finished her series of blog posts on hurricanes. The first two blog posts in the series was discussed in CliSci # 299. The third post about landfalling hurricanes show that there has been a statistically insignificant decreasing trends of U.S. landfalling total hurricanes and major hurricanes (Category 3-5) from 1900 to 2017. The fourth post discussed four recent U.S. landfalling hurricanes. Of the four, only the amount of rainfall in hurricane Harvey in 2017 can plausibly be link to global warming. Dr. Curry wrote a final blog post of the series on projections of hurricane activity to 2100 in response to human-caused global warming and the role of natural climate change. Climate models that parameterized hurricanes are far too sensitive to increasing CO2. They give climate sensitivities averaging 3.2 °C versus 1. 6 °C from a observationally-based energy budget study. This biases the impact of hurricanes high. Curry wrote “Most climate models predict a decrease in the global number of hurricanes by 2100.“ The GFDL hurricane model projects the maximum intensity will increase by about 5% during the 21st century and the median hurricane size will remain nearly constant globally. An investigation of the effects of natural decadal variability on hurricanes shows that the models do not have any prediction skill beyond a decade at most. This is because of large uncertainties in the timing of shifts in the multidecadal indices such as the Atlantic Multidecadal Oscillation (AMO) and the Pacific Decadal Oscillation. A shift of the AMO to its cool phase, expected in about 7 years, would likely result in fewer hurricanes, lower values of accumulated cyclone energy. The Jakobshavn Glacier in West Greenland drains 6.5% of the Greenland ice sheet and produces around 10% of all Greenland icebergs. It was the largest source of mass loss from Greenland over the last 20 years. A paper published last month in Nature says “Here we use airborne altimetry and satellite imagery to show that since 2016 Jakobshavn has been re-advancing, slowing and thickening. We link these changes to concurrent cooling of ocean waters in Disko Bay that spill over into Ilulissat Icefjord. Ocean temperatures in the bay’s upper 250 m have cooled to levels not seen since the mid 1980s.” The ocean cooling is linked to heat loss in the current that circulates around southern Greenland. A study of the urbanization effect on daily maximum and minimum temperatures in the United Kingdom found that the annually averaged minimum temperatures from surface weather stations in fully urban areas were 1.9 °C higher than rural areas while the daily maximum temperatures were not significantly affected by urbanization. In London, England, the urban heat island intensity (UHII) of the minimum temperatures (Tmin) is about 1.7 °C and Tmin UHII are above 1.0 °C in many UK cities. The UHII is stronger in Spring and Summer. The maximum change in Tmin of UHII is 2.2 °C in May. The degree of urbanization was calculated at 10 km X 10 km areas surrounding surface weather stations. The study says that the UHII is maximized during the night as heat absorbed by urban structures will be reradiated back into the atmosphere at a slower rate due to smaller sky views, than natural landscapes. Also, the impervious surfaces in an urban area causes a reduction of evaporative cooling. A hypothesis was proposed in the past that the dry regions will get drier and wet regions will get wetter in response to global warming, but historical precipitation records show that the hypothesis is true less than half of the time. Climate models are notoriously bad at predicting rainfall changes, and models can generate extremely different results for the same region. A study published in Geophysical Research Letters shows that climate models that best reproduce historical precipitation records converge in their predictions of water availability in the future, defined as precipitation minus water consumed by plants and evaporated by the Sun. This article says “When the team used only historically accurate models to simulate water availability from 2006 to 2100, they produced more consistent forecasts.” The accurate models predicted that severe drought “would be 5 times less likely to occur compared to the prediction by the full 36-model ensemble. Overall, the constrained group of models showed that previous projections of extreme future changes in water availability were less likely to occur on more than 70% of Earth’s land surface.” In short, models that better match historical records generate more consistent forecasts than models that fail to history match. That should be no surprise. The warming effect of black carbon (BC) and dust is a major contributor to Arctic warming. This study presents data and analysis for May and July 2016 of the effects of BC and dust in snow from the Juneau icefield in Alaska. BC is a by-product of burning biomass, forest fires and some fossil fuels. The dark particles absorb solar radiation, which enhances the melting of snow and ice. The radiative forcing (RF) of BC and dust averaged 4 W/m2 in May, increasing to 87 W/m2 in July as the aged snow increased the concentrations of the BC and dust. The RF was dominated by dust. By comparison, the RF of CO2 from 1750 to 2011 was only 1.7 W/m2. LAST CALL for tickets to our event with Dr. Susan Crockford and Dr. Willie Soon. Ticket sales end April 2nd. See our notice at the top of our home page, or order tickets here. According to the climate models, snow cover should have steadily decreased for all four seasons. However, the observations show that only spring and summer demonstrates a long-term decrease. 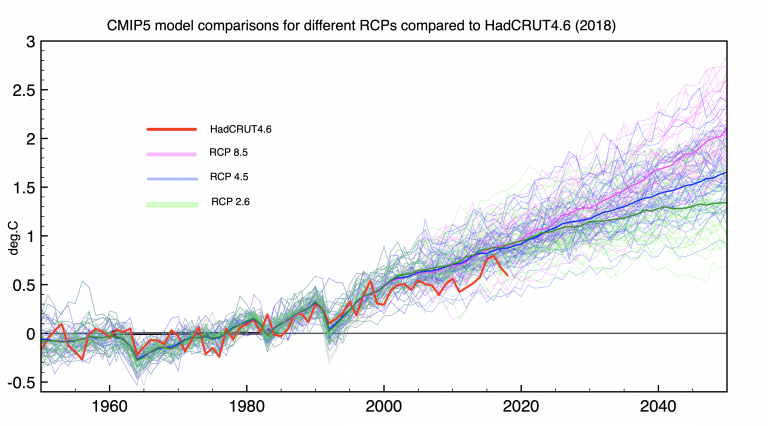 This paper, Connolly et at 2019, compared simulation runs from 24 climate model to satellite records over the period 1967 – 2018. Separate analysis was done for each of the four seasons. Only the spring and summer snow cover exhibited a long-term decrease, but the pattern was quite different from the model projections. The decrease in spring and summer largely occurred in a single step-change in the late 1980s. The observed negative trend for spring are larger in magnitude than the model-predicted spring trends. The observed trends for autumn and winter show a small long-term increase, contrary to the climate model projections that show decreasing snow cover. Snow cover increased for all seasons in the Tibetan Plateau region and China, while climate models predicted a decrease in snow cover. In winter, the average model snow cover trend (1967-2016) was -34,000 km2/yr, while the observed trend was +16,000 km2/yr. This is similar to autumn where the average model trend was -31,000 km2/yr, while the observed trend was +24,000 km2/yr. Larry Kummer, editor of the Fabuis Maximun website, wrote a review of Dr. Susan Crockford’s new book, “The Polar Bears Catastrophe That Never Happened”. He wrote “This is a fascinating book about science, about the making of public policy, about climate change, and above all – about nature. They all intersect in the debate about the future of polar bears. Zoologist Crockford crisply tells the history of the rise and fall of polar bears as climate change icons. It is an engrossing story of a small niche group of dedicated biologists, the apex predator of the polar regions, and the American public.” Key points are: Natural and non-climate human factors are ignored. Predictions were presented for public policy action before the underlying models are validated. The Polar Bear Specialist Group predicted in 2005 that the global polar bear population was likely to decline by more than 30% within the next 35 - 50 years. Instead, the population has increased by about 20%. The official book launch will be on April 10, 2019 in downtown Calgary, Alberta at the Centini Restaurant, 160 8th Ave SE from 12:00-2:00 pm. That evening she’ll be giving a presentation for the Friends of Science banquet and lecture event at the Red and White Club, in McMahon Stadium at the University of Calgary. The Namib is a coastal desert in southern Africa along the Atlantic coast. The pro-Namib is the transition zone between the arid Namib and the escarpments to the East that has a moderate amount of rainfall. This paper presents empirical evidence of increased vegetation cover from one hundred landscape photographs from the late 19th century to the present. Old photos were re-photographed to evaluate changes in woody cover. Vegetation change was related to values of precipitation and temperatures for the period 1948-2017. The abstract says “The resulting analysis reveals a trend of increased vegetation cover associated with increased precipitation (fog and rain) in the coastal Fogbelt and the inland Savanna transition with a shrinking of the hyper-arid Minimum zone between the two.” The results contradict regional climate model forecasts that project widespread aridification. Increasing vegetation is due to both increased moisture and CO2 fertilization. This report by Dr. Henrik Svensmark shows that the solar influence on climate is much larger than is recognized in government and IPCC reports. The report reviews three theories of how the sun can influence climate other than just the total heat output of the sun, called total solar irradiance. Dr. Svensmark says that the effect of sun modulating the galactic cosmic rays that effect cloud formation has received substantial empirical support in recent years. Other solar effects includes the solar ultraviolet changes and the atmospheric electric field effect on clouds. The report discusses the strong correlation between solar activity and global temperatures over the last 12,000 years. Experiments in 2006 showed that cosmic ray can create small aerosols (1 – 2 nm diameter) but it was disputed that those would grow large enough to effect clouds. Later experiments show that when air is exposed to ionizing radiation the aerosol clusters grow much more quickly to become cloud condensation nuclei (CCN) in the size range of 50 to 100 nm. Water droplets can form on CCN. Explosions on the sun called ‘Forbush decreases’ changes cloud characteristics, indicating that the cosmic ray – cloud link explains around 1 W/m2 forcing over the solar cycle. A new paper titled “Biomarkers reveal abrupt switches in hydroclimate during the last glacial in southern California” used biological proxy measurements from a sedimentary core to investigate the past climate variability of southern California. The study found that California’s climate has always been variable, even during the last ice age when CO2 levels were very low (about 200 ppm). The study contradict claims often made the California climate change in recent years is unusual. The abstract says “During the late glacial (32–20 ka) we find abrupt variability, with precipitation isotopic shifts (~70‰) that are independent of temperature swings implicating changes in storm track, rather than local temperature as drivers of the precipitation isotope signal. Temperature is however not irrelevant for hydroclimate: we find extreme warmth at 29.4 ka and 26.8 ka, the latter coincident with existing reports of an extended dry period (27.5–25.5 ka), suggesting a long hot and dry interlude during the generally cooler glacial period. An international team of researchers has found robust evidence for signatures of the 11-year sunspot cycle in the tropical Pacific. They analyzed historical time series of pressure, surface winds and precipitation with specific focus on the Walker Circulation—a vast system of atmospheric flow in the tropical Pacific region that affects patterns of tropical rainfall. They have revealed that during periods of increased solar irradiance, the trade winds weaken and the Walker circulation shifts eastward. A researcher at the University of Oxford said, “we detected a robust slowdown of the Walker cell during years associated with solar-cycle maxima." Along with changes in the wind anomalies, the dominant patterns of tropical precipitation shift to the central Pacific during solar-cycle maxima. As a result, rainfall decreases over Indonesia and in the western Pacific, and increases over the central Pacific Ocean. A climate model forced by only the 11-year solar cycle also showed much stronger wind anomalies in the Pacific during solar maximum. NASA research shows that Jakobshavn Glacier, which has been Greenland's fastest-flowing and fastest-thinning glacier for the last 20 years, has made an unexpected about-face. Jakobshavn is now flowing more slowly, thickening, and advancing toward the ocean instead of retreating farther inland. The researchers conclude that the slowdown of this glacier, known in the Greenlandic language as Sermeq Kujalleq, occurred because an ocean current that brings water to the glacier's ocean face grew much cooler in 2016. Water temperatures in the vicinity of the glacier are now colder than they have been since the mid-1980s. The research is based on data from NASA's Oceans Melting Greenland (OMG) mission and other observations. The cold water was set in motion by the North Atlantic Oscillation, which has switched to its cold phase. Climate model projections include some random variability that might simulate a portion of natural climate variability, but they do not include multidecadal or millennium scale climate variability seen in the temperature records. They don’t match the multidecadal oscillations of the 20th century. A paper published late last year, Kravtsov et al, investigated the discrepancies between observations and the models are reports “the discrepancies between the observed and simulated climate variability on decadal and longer timescale have a coherent structure suggestive of a pronounced Global Multidecadal Oscillation. Surface temperature anomalies associated with this variability originate in the North Atlantic and spread out to the Pacific and Southern oceans and Antarctica, with Arctic following suit in about 25–35 years.” None of the model simulations match the observed temperature oscillations in magnitude, spatial patterns or their sequential time development. Our annual Climate Change Science evening this year is featuring two excellent speakers who fight climate dogma every day. Please join us on April 10th for our Friends of Science Annual Event. Polar Bears: Researcher and Author – Dr. Susan Crockford: "Polar Bears: Too Hot to Handle" will be speaking about how a thriving species like the polar bear came to be classified as ‘threatened’ with extinction based on untested computer models. Solar Flares: Astrophysicist - Dr. Willie Soon: "The Sun Also Warms" will discuss the solar and orbital boundary conditions necessary for the study of Earth climate and how the sun affects the climate. No special climate science knowledge required. Purchase your tickets now. John Christy and Roy Spencer examined the paper which claims that the 40 year satellite record of global troposphere temperatures agree with climate model simulation so well that there is less than a 1 in 3.5 million chance that the agreement is by chance. Spencer wrote “The new Santer et al. study merely shows that the satellite data have indeed detected warming (not saying how much) that the models can currently only explain with increasing CO2 (since they cannot yet reproduce natural climate variability on multi-decadal time scales).” He explains that climate models are adjusted to produce no long-term warming or cooling in the absence of changing greenhouse gases, thereby eliminating the possibility of the models showing any natural climate change. Only greenhouse gases (mainly CO2) can cause substantial warming in the models. Sanders uses circular reasoning to conclude that the observed warming is human caused. The author’s metric for reporting the alleged agreement between models and observations is very misleading as it tells us little about the magnitude of the agreement. The graph on the home page of the FoSS website shows that the climate models average trend is 214% of the UAH satellite trend, which is very poor agreement. There have been several studies of tropical island and atoll area changes to assess their vulnerability to sea level rise. Atolls are ring shaped coral reefs in the mid-ocean, including a coral rim that encircles a lagoon. An atoll may included many reef islands. This latest study reanalyzed the available photo and satellite imagery of 30 Pacific and Indian Ocean atolls including 709 islands over several decades to a century. The study found that “no atoll lost land area and that 88.6% of the islands were either stable or increased in area, while only 11.4% contracted.” 73% of islands were stable and 15.5% of the islands increased in size. Islands that changed less than 3% in area were categorized as stable. The paper reports than “no island larger than 10 ha decreased in size”. Dr. Judith Curry is writing a series of article about hurricanes. The first article is about hurricane detection. It shows that the measurements of hurricane frequency and intensity is poor before 1970. Since 1981 there has been a slight decreasing trend in the number of all hurricanes with a slight increasing trend in major hurricanes. There is a slight decreasing trend in the global accumulated cyclone energy, the integral of hurricane frequency, duration and intensity. The study of storm occurrence prior to the historical record indicated that the recent hurricane activity in not unusual and there was a hyperactive period in the North Atlantic 3400 to 1000 years before the present. The second article about attribution says that the observational database since 1970 is too short to assess the full impact of natural variability associated with ocean circulations. Hurricane activity is affected by ocean oscillations such as the Atlantic Multidecadal Oscillation. There are usually twice as many hurricanes during La Niña than during El Niño years. Curry writes “The trend signal in hurricane activity has not yet had time to rise above the background variability of natural processes.” Any changes in hurricane activity due to manmade climate change are not yet detectable. The Labour Party in Australia proposes to cut CO2 emissions by 45%. An article published in the Australian reports on research by Brian Fisher and says the plan “would push electricity prices 50 per cent higher, cost workers up to Au$9000 a year in lower wages and wipe Au$472 billion from the economy over the next decade, according to the first independent modelling of the energy policies of both the government and opposition.” Brian Fisher is the former head of the Australian Bureau of Agriculture and Resource Economics. He also calculates that the cost of meeting the 26-28% reductions under the Paris Agreement would cost Au$70 billion in cumulative economic losses by 2030 and a 2% decline of real wage growth. Note: 1 Australian $ = 0.94 Cdn $. Jim Steele, 25-year past director of San Francisco State University’s Sierra Nevada Field Campus, wrote an article on sea level rise that shows many coastal cities are sinking much faster than sea levels are rising. He wrote “Pumping out groundwater not only causes lands to sink, it increases the oceans’ volume. China’s Huanghe Delta is sinking 10 inches a year. Southeast Asian cities battle sinking rates of 1.2 to 2.4 inches per year. Regions around Houston, Texas had sunk 10 feet by 1979; a disaster waiting to happen where hurricanes commonly generate 15-foot storm surges. Likewise, New Orleans was doomed by sinking 1.4 inches per year.” Ocean warming and glacier melting has added only 0.06 inches per year of sea level rise from 1850 to 1990. One reason why climate models overestimate global warming is that they assume too much of the emitted CO2 stays in the atmosphere. The terrestrial CO2 sink as been increasing in recent decades. This paper estimates the influence of CO2 and nitrogen deposition and their interactions to changes in net primary production using a land model. The paper reports that nitrogen deposition and the CO2-N2 synergy were significant contributors to the current increasing terrestrial CO2 sink that led to a substantial increase in CO2 fertilization, which provides great economic benefits by increasing crop and forest yields. The Global Warming Policy Foundation published a report by Paul Homewood about Tropical Hurricanes that summarizes recent studies and hurricane data. The IPCC reported in its 2013 assessment “It is unlikely that annual numbers of tropical storms, hurricanes and major hurricanes counts have increased over the past 100 years in the North Atlantic basin.” The observation methodology of hurricanes have changed dramatically since the 19th century, so older records prior to the satellite era likely under report the frequency and intensity of hurricanes. Homewood wrote “Data provided by HURDAT also shows that recent hurricane activity in the North Atlantic has not been unusual by historical standards. In 2017, there were six major Atlantic hurricanes, but the highest total recorded was eight in 1950.” The hurricane record show decadal variability that strongly correlates to the Atlantic Multidecadal Oscillation which has been occurring for at least a millennium. The cold phase of the AMO results in drought in the Sahel, causing dust over the Atlantic Ocean that lowers the intensity of hurricanes. Available evidence confirms that hurricane frequency has been as great in many prior periods as it has been recently. There is no evidence that global warming has increased the frequency of hurricanes. Some scientists have promoted the idea the global warming causes more polar vortex disruptions thereby leading to more frequent extreme cold outbreaks in the mid-latitudes. Bob Vislocky tests this theory using long temperature records of the northern USA from NOAA. Vislocky says If there has been an increase in extreme cold outbreaks, “then the temperature difference in winter between the warmest day and the coldest day should increase over time.” The average trend over 1875 to 2019 of the temperature difference between the warmest and coldest winter days of the records he selected is a decrease of 0.22 °C/decade. This means that the coldest winter days are increasing at 0.22 °C/decade faster than warmest days, thereby disproving the theory that warming is causing more extreme cold outbreaks. The variability of the ultraviolet (UV) part of the solar electromagnetic spectrum is 100 to 1000 times greater than the variability of the total solar irradiance depending on the wavelength. Solar output has generally increased throughout the 20th century, contributing to global warming. Changes in UV radiation affects the quantity of ozone in the stratosphere which changes its temperature, eventually affecting surface temperatures. A paper published in Geophysical Research Letter says that recent “advancements have let to more robust observational data.” The ozone response to solar variations is best represented by a new BASICv2 ozone composite and those based on Solar Backscatter UV satellite instruments alone should not be used. The observed solar cycle signal exhibits an upper stratosphere U‐shaped spatial structure with lobes emanating from the tropics to high altitudes at mid‐latitudes. See here for a description of the UV-Ozone-Climate process. We are pleased to announce a Climate Change Science evening featuring two excellent speakers who fight climate dogma every day. Please join us on April 10th for our Friends of Science Annual Event. * Early Bird ticket pricing discount ends February 28th. Polar Bears: Researcher and Author – Dr. Susan Crockford: "Polar Bears: Too Hot to Handle" will be speaking about how a thriving species like the polar bear came to be classified as ‘threatened’ with extinction based on untested computer models. Solar Flares: Astrophysicist - Dr. Willie Soon: "The Sun Also Warms" will discuss the solar and orbital boundary conditions necessary for the study of Earth climate and how the sun affects the climate. No special climate science knowledge required. Purchase your tickets now. NASA scientists from the Goddard Institute for Space Studies (GISS) said that the Earth’s average surface temperature in 2018 was the fourth-highest ever recorded. The GISS index is contaminated by the effects of urbanization and poor siting of surface stations. Here is a graph of the GISS temperature index compared to the UAH6.0 lower troposphere satellite temperature index of global temperatures. According to AGW theory, the lower troposphere is supposed to increase at a faster rate than the surface temperatures, but the datasets show the opposite results. The graph shows that the GISS trend is too high by 0.05 °C/decade due to the urban heat island effect. By the satellite record, 2018 was the 6th warmest year since 1977. Dr. Clive Best compared suite of climate model temperature anomaly simulations for different representative concentration pathways (RCPs) to HadCURT4.6 near-surface global temperature measurements. The models runs and the observations temperatures are relative to the monthly base period 1961-1990, meaning that the average of each month over this 30-year period of each climate model run and the temperature measurements are equal, but the trend over the period may be different. 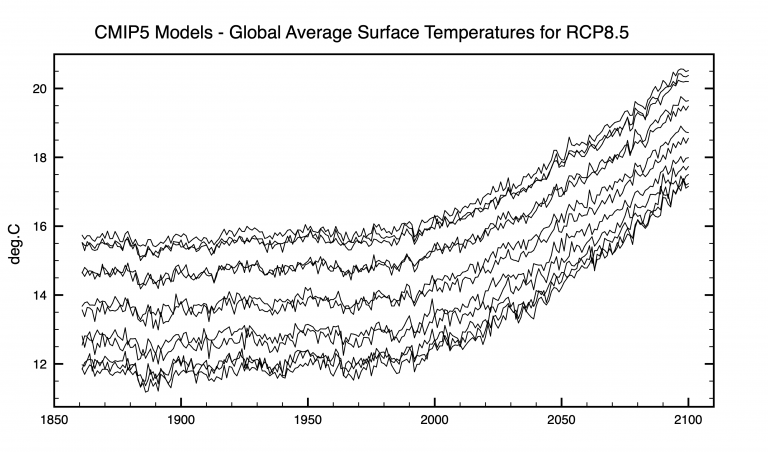 His graph shows the temperature data lies below all the RCP simulations after 1998. Best also produced a graph of absolute temperatures, not anomalies, from 12 different models of the RCP8.5 emissions scenario. He wrote, “The disagreement on the global average surface temperature is huge – a spread of 4°C. This implies that there must still be a problem relating to achieving overall energy balance at the TOA [top-of-atmosphere].” This appears to a big problem for the calculation of the albedo related to snow and ice, which depends critically of the actual temperature difference from the melting/freezing point. • Contemporary estimates of the trend in 0–2000 m depth ocean heat content over 2005–2017 are significantly (> 95% probability) smaller than the mean CMIP5 model simulation trend. On the first point; the IPCC AR5 report mentioned 5 studies of ocean warming 0 to 700 m, but it used only the highest estimate of global warming for good reasons, the other assessments did not evaluate all of the ocean areas. AR5 assessed the 0 to 2000 m warming rate at 0.36 W/m2, which is almost identical to the average of 3 recent estimates of 0.37 W/m2. [The m2 relates to the total Earth’s area, not ocean area] The Cheng 2019 paper falsely said that AR5 reported a 0 to 2000 m warming rate of 0.20 to 0.32 W/m2. On the second point; Cheng 2019 falsely claimed that the warming rate over 2005–2017 for the top 2000 m from recent studies is consistent with the climate model mean. The model mean rate is 0.70 W/m2, much greater that the 0.54 estimated by Cheng 2019, and greater than the 0.60 W/m2 average of three recent studies. Lewis says the uncertainty of the Cheng estimate is three time that reported by the authors. Dr. Roy Spencer also reviewed the Cheng paper and emphasizes that the climate models give a huge range of ocean warming rates as shown in this graph. He writes “for the period in question (1971-2010) [the plot] shows a factor of 8 range between the model with the least ocean warming and the model with the most warming, based upon linear trends fitted to the model curves”. This huge range is mainly due to uncertainty in climate sensitivity and the effects of aerosols. The error ranges on the climate model mean in the paper “refer to how well each time series of heat content (whether observations or models) is fit by a regression line. That tells us nothing about how certain the dataset or model is as it assumes the datasets are perfect. He gives the warming rate of the oceans in more familiar units of degrees Celsius, “During the period 2005-2017, the oceans (0-2000 m) have warmed at a rate of 0.003 °C per year.” That is 0.03 °C/decade; very slowly. Dr. Judith Curry reviewed the early 20th century warming period (and mid-century cooling) with respect to climate forcing attribution. According to the global near-surface temperature record HadCRUT4.6, the warming trend 1910 to 1945 was 0.14 C/decade, which was almost identical to a UHIE corrected HadCRUT warming trend 1970 to 2003 of 0.15 °C/decade, see graph. Do Atmosphere Temperatures Support Greenhouse Gas Warming Theory? A paper published this month in Journal of Atmospheric and Solar-Terrestrial Physics evaluated the atmospheric temperature trends of the UAH satellite temperature record to determine if the data supports the theory that global warming is mainly due to the increase in greenhouse gases, hereafter GHG theory. The paper evaluated temperature trends in four vertical regions and five latitudinal bands. The GHG theory (as used in climate models) requires that the temperature change is more enhanced at high altitudes than near the surface, that near-surface temperature trends are amplified at high latitudes in each hemisphere, that the stratosphere temperature decline in response to tropospheric warming and that the tropopause increases in height. • The troposphere temperature trends decreases with height. • The lower troposphere temperature trends in the southern hemisphere decreases at high latitude. • The thermal regime in the lower stratosphere is mainly affected by the ozone dynamics and not by the thermal regime in the troposphere alone. Therefore, the observed cooling in the lower stratosphere cannot be attributed unambiguously to the warming of the troposphere. • The near zero trend of the tropopause cannot support the increase in the height of tropopause. Each of the four points is contrary to GHG theory. The atmospheric temperature data does not support the GHG theory, but contradicts it. It is ski season again! I was skiing at Lake Louise the day after 77 cm of new snow. I am interested in how global warming might be effecting fall and winter snowfall. Rutgers Snow Lab of Rutgers University publishes weekly data of the northern hemisphere and regional snow cover. The average snow cover of the northern hemisphere from 1972 to 2018 is 25 million km2 and the trend is -0.14 ± 0.11 million km2/decade, which is tiny. The trend from 1990 to 2018 is +0.24 ± 0.11 million km2/decade, which is small but positive. On a quarterly basis, from 1979 to 2018, the trend in the fall (months S,O,N) is significantly positive. There is no trend in winter (D,J,F) and snow in the spring and summer have decreased slightly. Dr. David Viner of Climate Research Unit in the U.K. predicted in March 2000 “within a few years winter snowfall will become a very rare and exciting event. Children just aren’t going to know what snow is.” His prediction was a major blunder. The climate forecasts produced by the IPCC are done by taking the simple average of the predictions of 29 groups of climate models. Dr. Pat Michaels says that this practice is “foolhardy” as some models are terrible at forecasting, example, the Canadian climate model, most of them are running too hot, and some models are better than others in specific applications. The Russian climate model actually tracked the observed climate quite well. A paper “Taking climate model evaluation to the next level” published this month says “Owing to different model performances against observations and the lack of independence among models, there is now evidence that giving equal weight to each available model projection is suboptimal.” That is an understatement. The paper proposes “advanced methods for model weighting” based on comparisons of models to observations. The paper presents a map of sea-surface temperature errors of the average of all the climate models compared to the observations. The model errors range from -2.5 °C to over 2.5 °C is some regions. The models have almost the entire southern circumpolar sea too warm, much of it off more than 1.5°C. The seas off the west coasts of South America and Africa are more than 2 °C too warm in the models. These are regions where cold water upwells to the surface and are responsible of El Nino events. Judith Curry published an initial review about “overconfidence” of the US 4th National Climate Assessment (NCA) report, volume 1, which is about climate science. She notes that chapter 1 says that average temperatures in recent decades have been much higher, and have risen faster than at any time in the past 1,700 years, with ‘high confidence’. This contradicts IPCC AR5 report which says the average “NH temperatures, the period 1983-2012 was … likely the warmest 30-year period of the last 1400 years (medium confidence).” Based on various statements in AR5, the “medium confidence” is not justified. “High confidence” also contradicts a statement in the NCA that says “there are still many uncertainties in understanding the hemispheric and global changes in climate over Earth’s history, including that of the last few millennia.” The NCA relied on Mann et al. 2008 and PAGES 2k Consortium 2013. The Mann et al 2008 report was a hockey stick paper that used stripbark bristlecone pine trees which grows rapidly in response to CO2 fertilization, not temperature. The PAGES 2k reconstructions were strongly criticized by Steve McIntyre for also using the stripbark bristlecone pine series and for only selecting series that had a hockey stick shape. The definition of ‘high confidence’ in NCA is “moderate evidence (several sources, some consistency, methods vary etc. ), medium consensus” which sounds like only ‘medium confidence’. A paper published this month presents estimate of ocean heat content from 1875 to 2017 for depths 0-700 m, 0-200 m and below 200 m for both the global ocean and the Atlantic ocean. The paper reports that the global ocean absorbed as much heat during 1921–1946 as during 1990–2015. Since the 1950s, up to one-half of excess heat in the Atlantic Ocean at mid-latitudes has come from other regions via circulation-related changes in heat transport. The abstract says “We find that the global ocean absorbed heat during this period at a rate of 0.30 ± 0.06 W/m2 in the upper 2,000 m and 0.028 ± 0.026 W/m2 below 2,000 m, with large decadal fluctuations.” The authors wrote “Our results highlight that the substantial amounts of heat accumulated in the ocean and associated sea-level rise can be influenced by ocean circulation changes and low- to midlatitude air–sea interactions. James Steele was director of a university field station in the Tahoe National Forest for 25 years. He wrote about the horrific Camp Fire is Paradise, California that destroyed rows of homes while surrounding trees were merely scorched. He says that large fires have recently burned 1.8 million acres per year in California, but before 1800, fires burned 4 million acres per year despite cooler temperatures. Wildfire have increased since 1970 relative to previous decades when there was intensive fire prevention and fire fighting to extinguish fires as soon as possible. In the 1970s the US Forest Service switched to a “let it burn” policy if human-made structures were not endangered. The Ponderosa pines around the town of Paradise endures fires about every 11 years. Governor Brown vetoed a bill to secure the power grid two years ago. A power line caused the ignition that started the fire that was fed by “fine fuels” such as leaves and underbrush. High wind fanned the fire into an inferno. Buildings that had “defensible space” without “fine fuels” nearby were spared. Any warming of the land during the cool seasons due to CO2 will help to reduce the winds that fan wildfires. Climate change had nothing to do with the fire. A new paper titled “Biomarkers reveal abrupt switches in hydroclimate during the last glacial in southern California” used biological proxy measurements from a sedimentary core to investigate the past climate variability of southern California. The study found that California’s climate has always been variable, even during the last ice age when CO2 levels were very low (about 200 ppm). The study contradict claims often made the California climate change in recent years is unusual. The abstract says “During the late glacial (32–20 ka) we find abrupt variability, with precipitation isotopic shifts (~70‰) that are independent of temperature swings implicating changes in storm track, rather than local temperature as drivers of the precipitation isotope signal. Temperature is however not irrelevant for hydroclimate:we find extreme warmth at 29.4 ka and 26.8 ka, the latter coincident with existing reports of an extended dry period (27.5–25.5 ka), suggesting a long hot and dry interlude during the generally cooler glacial period.